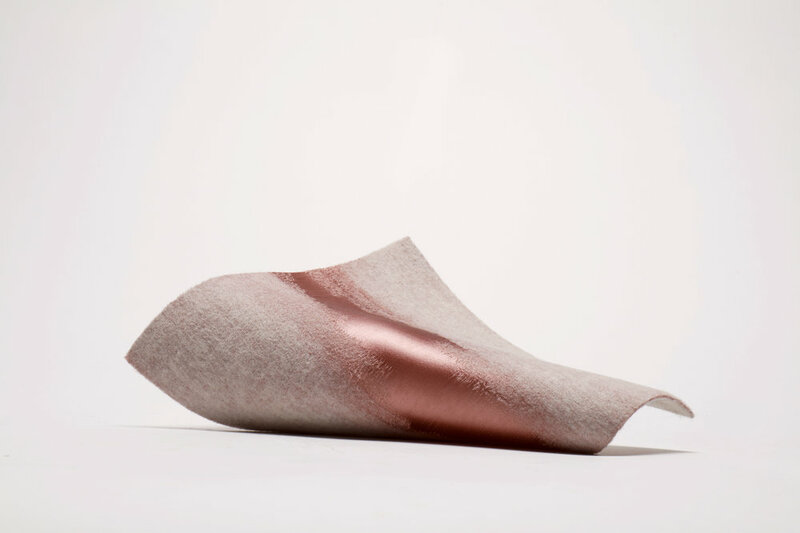 GOAL: To physicalise the emotion of scent into tangible materials. If you could not smell, how could you experience the qualities of scent through sight and touch. Initial research with commercial scents. (above) What are the most instinctive associations that arise from smelling these scents? What is their weight? Their colour? Geographical placement? Their journey and how they develop over time? Their layers? This was a useful grounding for the project, however i felt i wanted to be closer to the subject. Drawbacks with mass produced, commercial scents meant there was always the risk of their branding informing your associations with the scent. 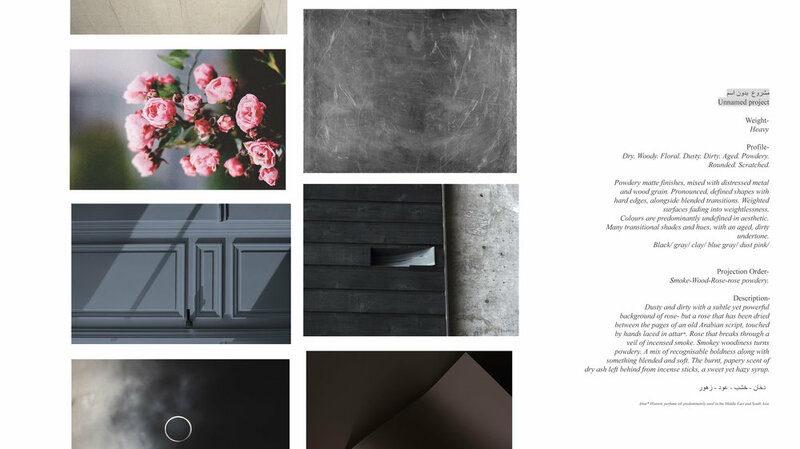 I wanted to work with something neutral and non-biased…where the scent and its composition were the only sources of influence. I approached perfumery house 4160Tuesdays, to collaborate on a project. 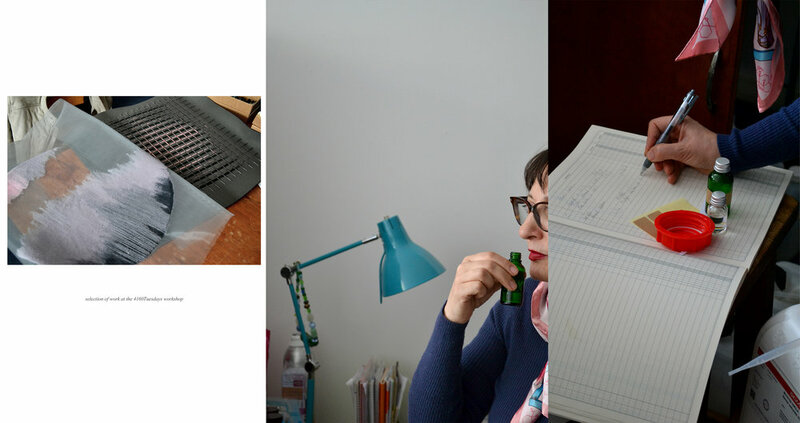 Working with one of the in-house perfumers, we were able to create some initial tests. Whilst creating, i was constantly thinking about what emotions and imagery they evoked. I created a focus group with around 18 people to begin to understand what associations/ memories / keywords came to their minds when they smelt the scent. The demographic was culturally varied, as i was aware certain cultures have scents that are prominent (India-Sandalwood, Middle East-Oud), and was interested to see whether a note in one culture was reminiscent to something completely different in another. Everyones response was different but there were some key similarities. Some were literal, some were abstract. This allowed me to pick out reoccurring associations for the ‘scent profile’ i was to create next, and to avoid a solely ‘personal’ response. It had to be inclusive and relatable. 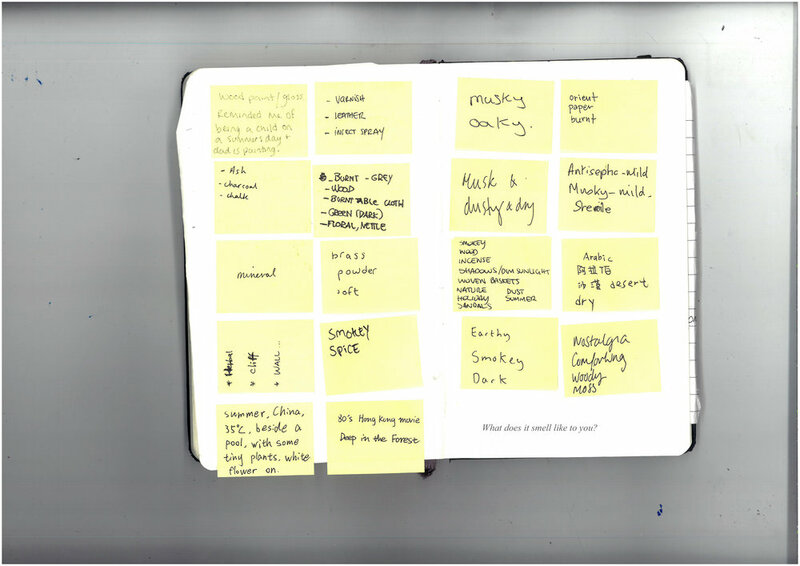 After creating a scent i was happy with to base the project around, i created a profile for the scent to refer back to when creating material responses in stage 2. I wanted to make sure that every material and component used within the pieces had significance and reflected a quality in the scent, to allow for the most vivid of descriptions for anyone who was unable to smell scent. Felted wool base in murky grey brown tone. This signifies the dirty, smokey quality, heavy, weighty and powerful. Long-lasting and impactful. Piano wire rods inserted between embroidery in a grid formation. This placement was used to further reinforce the weight of the scent. Black needle felted wool emerging through the murky grey base. This detail is subtle, it fades in and fades back out but is noticeable. This represents the burnt, papery scent that appears within the first 15 seconds of spraying. Tones of pink and grey embroidery in matte cotton and metallic rayon. The varying finishes of the threads fade into one another subtly, to delicately reveal a circular pink silhouette that glows under the light. Representative of the final base note of the scent that is left on your skin- a chalky but bright rose note shrouded amongst smoke. 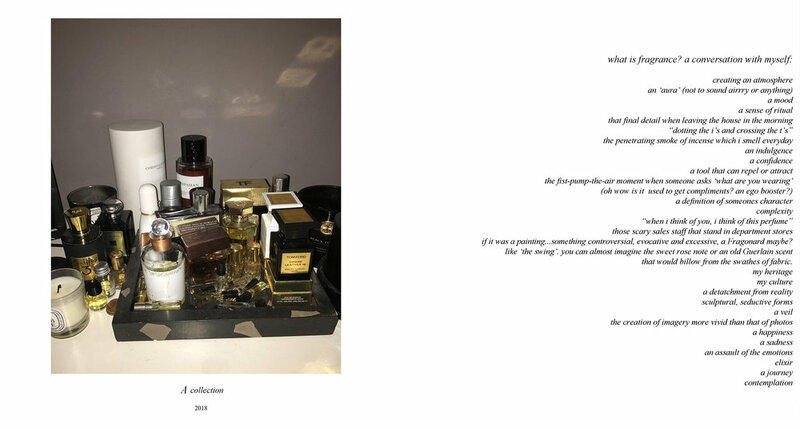 The work created in Stage 2 was then taken back to 4160Tuesdays, this time Sarah McCartney (Perfumer and founder of the company) created a response to the work in front of her. I’m Arun, A visual & experience designer for both digital & physical products. Currently based in the U.K.